Yerba mate (Ilex paraguariensis) is mainly known for its use in the preparation of two types of drinks, mate, also known as chimarrão, and tereré. Though these two drinks present similar preparation techniques, they certainly have characteristics of their own. Both mate and tereré are typical drinks in South America, originating from the region between Paraguay, Argentina and Brazil but today this culture has somewhat spread to various corners of the continent. Brazil is known mainly for its consumption of chimarrão, while Paraguayans prefer their tereré. The term “chimarrão” is used mainly in Brazil, while in Spanish language regions (and the rest of the world) the term “yerba mate” is more common. The difference between the two drinks lies mainly in the temperature of the water used for the infusion. Tereré is typically consumed with cold water, while mate is essentially a hot drink (around 75°C). Being a cold and refreshing drink, tereré is widely consumed in warmer regions and mate in regions with lower temperatures, such as southern Brazil and Argentina. The most widely used bottle for consumption of mate is the 1 liter aluminum thermos flask with thin nozzle that can easily be closed in order to maintain the temperature. There are also those who prefer to use coffee flasks. Notice that the flasks don’t need to be so large, since mate is not consumed as fast as tereré. For tereré consumption, however, there is virtually no limitations to which flask or bottle you may use. Everything from small to large… 1 liter to 5 liter-recipients are fine. 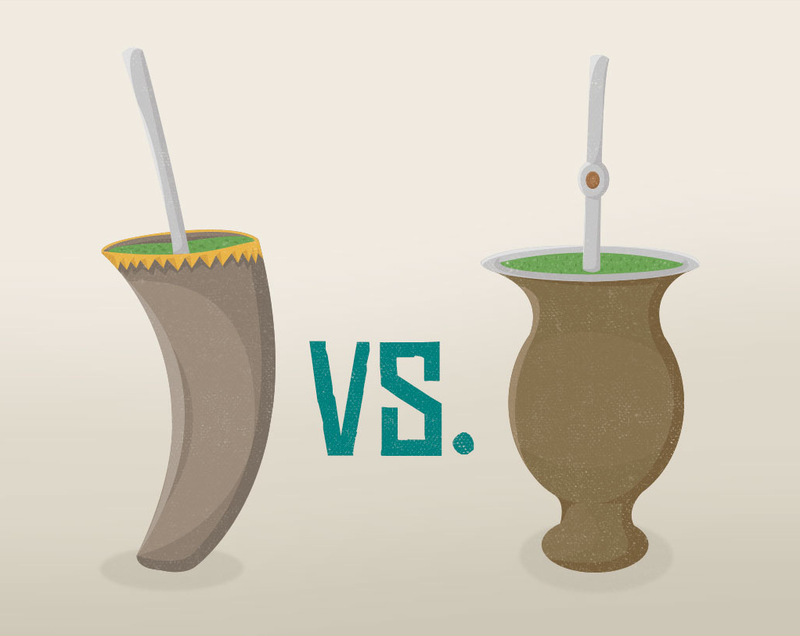 Both drinks keep the flavor of the infusion of the herb, but tereré yields a stronger and more bitter taste. Ilex paraguariensis is the main ingredient in both drinks, but a typical tereré blend is composed of a lot more thick leaves and stems than the traditional mate blends. Gourd or guampa, is the name given to the container where the yerba mate infusion is consumed. The gourd used for drinking mate comes in a variety of sizes and has a round shape, which facilitates the correct placement of the yerba as well as the handling. A guampa is usually used for drinking tereré. Guampas present a curve-shaped body (similar to an ox horn) and can be made from a larger array of materials like plastic, glass and aluminium. I drink both and would have to disagree…..the heat infuses a stronger and more bitter tea for sure. T-Ray is softer and can sit a while in the guampa before getting some kick.